We’d love your help. Let us know what’s wrong with this preview of An Unpresentable Glory by Eleanor Gustafson. To ask other readers questions about An Unpresentable Glory, please sign up. DNF @ 23%. This review has very, very minor spoilers, I promise. I'm sorry, but I just... thoroughly did not enjoy the first part of this book, hence the DNFing. The very beginning was alright and made for a great hook--I started off reading this book thinking that I would enjoy it because it drew me in so well. However, things got progressively worse for a couple of reasons, so I finally decided to shut it and turn to another book. There were mainly a lot of content issues, but the writing style DNF @ 23%. This review has very, very minor spoilers, I promise. There were mainly a lot of content issues, but the writing style made the book really difficult to follow (along with the formatting of the ebook), and I honestly had no idea what was happening by the time I DNFed it. - The MC "rescues" a sick married man who fainted (okay, technically, he was weak and fell into her garden of... delphiniums) and takes him into her house and tends to him, which is fine. - Both of them have an instant attraction to each other, which is human of them to do. - However, neither of them do anything about it. They don't even fight the attraction. Personally, I strongly don't believe that this is okay. I mean, the man is married, for goodness' sake! The formatting of the Kindle ebook made the story really difficult to follow. This isn't the publisher's / book's fault as this is a review copy and not the final version, but I wanted to mention it anyway since it contributed to my DNF of the book. First off, this book gave me a greater appreciation for those who handle political slander well. Jay and Linda were almost always under attack for one reason or another, and yet through it all they stood strong and leaned on God. One of the big themes that was threaded throughout the novel was that God moves in ways we don't expect. All the problems Jay and Linda face end up coming together for good, even if it's the result of many hardships. Another theme is how love manifests in different ways First off, this book gave me a greater appreciation for those who handle political slander well. Jay and Linda were almost always under attack for one reason or another, and yet through it all they stood strong and leaned on God. One of the big themes that was threaded throughout the novel was that God moves in ways we don't expect. All the problems Jay and Linda face end up coming together for good, even if it's the result of many hardships. Another theme is how love manifests in different ways, such as in romantic ways or in a parent-child kind of way or between friends. Both were tied into the story well and gave it depth. Native American culture has fascinated me since I was little, so having that aspect tied into the story and seeing some of the effects on today that Jay had to handle also added a measure of appeal to the story. It was incorporated well. I found all the characters to be well-written. I sympathized with them as they faced new trials and felt their anguish or rejoiced with them when something good happened. The world of politics was also accurately depicted, from the good to the ugly. All of the characters had a place in the story and none of them felt like they could have been removed. The character growth that went on was tremendous as well. I would recommend this title to anyone who needs hope in their life or is looking to find a story with love past the typical mushy-gushy romances. An Unpresentable Glory is a literary novel full of beautiful prose. The detailed scenes gave color and depth to the imagination as it is read. The faith and emotions portrayed the ups and downs and mimicked real life. Eleanor Gustafson was able to touch base on a number of social issues without inserting her own political leanings. Instead she gave an unbiased look into the political scene and how tragedy can become a catalyst for numerous scandals and lies, but also a path to truth and honesty. An Unpresentable Glory is a literary novel full of beautiful prose. The detailed scenes gave color and depth to the imagination as it is read. The faith and emotions portrayed the ups and downs and mimicked real life. Eleanor Gustafson was able to touch base on a number of social issues without inserting her own political leanings. Instead she gave an unbiased look into the political scene and how tragedy can become a catalyst for numerous scandals and lies, but also a path to truth and honesty. If I had to compare Eleanor's writing it would be a cross between Georgette Heyer and Denise Hildreth Jones, lyrical prose with modern day charm. In An Unpresentable Glory characters grapple with contemporary challenges, besetting sins, tragedy, grief, and longing. God meets them at every turn. His persistent, redemptive love permeates every page and transforms every life. Eleanor Gustafson’s story is both timely and timeless. Eleanor Gustafson is a new author for me, but she is not new to her fans. I enjoyed Unpresentable Glory very much and look forward to reading more by this author. As a matter of fact, I’ve already checked to see what else she has written. Have you ever heard of, or maybe even participated in, a garden tour? Garden tours are special tours of certain gardens in a specific neighborhood or town. Due to the expense of maintaining a garden people would want to tour, many of these types of tours are at Eleanor Gustafson is a new author for me, but she is not new to her fans. Have you ever heard of, or maybe even participated in, a garden tour? Garden tours are special tours of certain gardens in a specific neighborhood or town. Due to the expense of maintaining a garden people would want to tour, many of these types of tours are at the homes of affluential people. Such is the case for Linda Jenson, a never married, 40 something, well off heiress, who continues the passion of her predecessors. Her gardens are beautiful and well known, being maintained by a hired gardener and his crew. Linda enjoys her garden, spending many quiet moments walking or just sitting. One afternoon, having concluded her walk, Linda spies a man lying under the shrubbery. She finds that the man has passed out, however, when she is finally able to awaken him, she learns he is more sick than a simple faint. Refusing medical attention, Linda ends up getting him into her home and ensconced in her guest room. Remember, this man is a complete stranger. She cares for him until he is well enough to go to his own home, a time of 2 to 3 weeks. As healing continues, the two find they have much in common and a special connection begins to form. The stranger asks her to call him Jay; he never provides his full name nor does he provide any personal information. When he is well enough to go, he leaves. It doesn’t take long for Linda to find out who Jay really is because he is somewhat famous. She’s not much of a tv watcher, but one day she turns on the news, and there he is. When scandals erupt, Linda is somehow dragged into them. She watches from afar as the man she believes she loves is dragged through the muck of personal and professional tragedy; she promised she would never attempt to contact him or even mention his stay. She keeps that promise. Throughout the novel are special moments the author calls “unpresentable glory”, those moments where one may recognize the hand of God. Personally, I call them “God Moments”; some call them coincidences. It is a recognition of the influence of Gods grace in our lives that is quiet and unnoticeable, unless one is attuned to listen and watch. While the author weaved many moments of unpresentable glory throughout the novel, I think the best one was the very last one. This is the most interesting novel I have read for a while. I liked learning about the complex structure and design of a show garden. I liked learning about Native Americans and the issues they face today. I liked reading about how an investigative reporter can nearly ruin a politician's career. Gustafson incorporated many Christian lessons in this novel, such as how a male support and discipleship group may work. There was also a strong example of the damage that can be done when Christianity is This is the most interesting novel I have read for a while. I liked learning about the complex structure and design of a show garden. I liked learning about Native Americans and the issues they face today. I liked reading about how an investigative reporter can nearly ruin a politician's career. Gustafson incorporated many Christian lessons in this novel, such as how a male support and discipleship group may work. There was also a strong example of the damage that can be done when Christianity is presented to others in an unloving way. Permeating the novel was the idea of doing a kindness for another that cannot be made public. It is an act that brings glory to God yet must be kept secret, as unpresentable to others. The romance aspect of the novel was complex and took a long time to resolve. Nonetheless, it was interesting how an immediate and intense love formed and then how the obstacles to it were overcome. This is a good novel for readers who enjoy gardening and like characters committed to pursuing romance God's way. An Unpresentable Glory is not your typical Christian fiction romance read. This was a book I was able to lay aside but finally finished it. The story could easily be replaced as news in the political arena with hidden secrets, scandals, untruths along with every day events that society is dealing with currently. The heroine, Linda Jensen, garden would be a wonderful place to sit quietly and renew the inner man but yet she took in an ill man without questioning him for more information, which see An Unpresentable Glory is not your typical Christian fiction romance read. This was a book I was able to lay aside but finally finished it. The story could easily be replaced as news in the political arena with hidden secrets, scandals, untruths along with every day events that society is dealing with currently. The heroine, Linda Jensen, garden would be a wonderful place to sit quietly and renew the inner man but yet she took in an ill man without questioning him for more information, which seemed unrealistic. There are multiple characters beside of the hero and heroine with plenty of action and running from others that gave way to infused drama. There is an interweaving of God’s love that each character encountered sometime during the story to gain their unpresentable glory from God. While categorized (at least in part) as a romance, An Unpresentable Glory has its own cadence. The main characters see each other only twice, and briefly at that, in the three years after they meet. But that separation allows seeds of faith to take root, be watered and nurtured, and grow into something beautiful—most notably in Jay’s life. Eleanor K Gustafson touches on many difficult topics—loss, loneliness, depression, and mental illness—yet readers are also reminded of the importance and result While categorized (at least in part) as a romance, An Unpresentable Glory has its own cadence. The main characters see each other only twice, and briefly at that, in the three years after they meet. Eleanor K Gustafson touches on many difficult topics—loss, loneliness, depression, and mental illness—yet readers are also reminded of the importance and results of accountability and the power of prayer. For Linda and Jay, it is a long a difficult road but when they seek the counsel of men and women of faith and listen to the voice of God. It took me a bit to get used to Gustafson’s style and more than once I wanted to give Jay a good shake to help him get his head on straight. Sometimes I wanted Linda to find her joy and move on with her life. But in the end, it’s those trials that made these characters bloom. And what better foundation than one cemented with time, prayer, and God’s love. I found An Unpresentable Glory to be one of the most captivating books I’ve read in a while. So many twists and turns are woven into this story of redemption and grace. Just when you think you’ve got the storyline figured out, a surprise shows up! It has a touch of a fairy tale, political thriller, romance, and Native American and Latino histories, with the undercurrent of a potentially life-changing message. The author uses beautiful garden descriptions to illustrate her message of God’s healin I found An Unpresentable Glory to be one of the most captivating books I’ve read in a while. So many twists and turns are woven into this story of redemption and grace. Just when you think you’ve got the storyline figured out, a surprise shows up! It has a touch of a fairy tale, political thriller, romance, and Native American and Latino histories, with the undercurrent of a potentially life-changing message. The author uses beautiful garden descriptions to illustrate her message of God’s healing. He uses our “unpresentables” to bring glory to him; we just have to allow him to use us, even with our “weeds”. Only through God’s grace can we learn to extend grace and love to others. A pleasant, enjoyable read, not preachy at all, it’s a book I highly recommend. I had trouble putting it down! Dang it, Ellie, you did it again. I started out to pace myself, a few pages a day and savor the story. But no, you wouldn't let me. Before I knew it, another all-nighter as you sucked me into this fascinating tale of intrigue and treachery. You build subplots on subplots, weave your characters in and out of the tale, always choosing the exact word needed to advance the story. Just to get even, I'm going to read it again before I buy another of your books. Creating a story of love, loyalty, politics, mental illness, trauma, and gardening-all bound together with Christian threads is seamlessly done by Eleanor. Her characters are well developed and varied. Once I got past the initial unique opening sequence and became immersed, I carved out the time to finish it. There were a couple of places in the middle where I lost my way, but the story of her main characters' struggles pushed me through. This was my first 'Christian' read, and I enjoyed it. Wow; just w.o.w. I wish I could give this unparalleled story ten stars. It may have been slow in getting reviews, but there's a reason why those who did review this book gave it five stars. I do too. It's the story of two people who cannot fall in love but do, and it's absolutely nothing like the typical romance. A man with a severe allergy to bananas collapses in Linda's garden in anaphylactic shock. Linda knows she must help, and he begs feebly that she not reveal that he is in her care. She he Wow; just w.o.w. I wish I could give this unparalleled story ten stars. It may have been slow in getting reviews, but there's a reason why those who did review this book gave it five stars. I do too. It's the story of two people who cannot fall in love but do, and it's absolutely nothing like the typical romance. A man with a severe allergy to bananas collapses in Linda's garden in anaphylactic shock. Linda knows she must help, and he begs feebly that she not reveal that he is in her care. She helps him into her house and a bed. puts pajamas on him, and nurses him back to health. It takes him a week to get on his feet, and then she shoos him out the door, telling him to go back to his wife. No, he didn't tell her. All she knew about him was that he said to call him Jay. They deliberately avoiding discussing anything personal. But somehow she knew. I cannot recommend this book too highly. I believe this will become a popular classic. Available from Amazon and Barnes and Noble. Sometime in our life we've all had the thought that we would run things differently if we were in charge. That did cross my mind several times as I read this book and tried to figure out how this could possibly come right in the end. The author has crafted this story completely in keeping with God's character and leading to an extremely satisfying conclusion with lots of surprises and blessings beyond my imagining! Well done! I was intrigued from the start …”Her immediate problem lay face-down between her perennial border and clematis arbor – more specifically, a man who looked to be either dead or unconscious.”. Her first instinct is to call 911 but the man pleads with her not to. She helps him into her home.The story could have gone lots of ways from there. Personally, I don’t know if I would have done that, but Linda (a single woman) thought she could take him down because he was so sick. She looked in his eyes an I was intrigued from the start …”Her immediate problem lay face-down between her perennial border and clematis arbor – more specifically, a man who looked to be either dead or unconscious.”. Linda nurses the man back to health, a bond is created that remained strong as their lives went in opposite directions. They both feel that they had encountered something very special an “unpresentable” moment. He had asked to be called Jay. Never gave his full name. Later on, Linda finds out who he really is and is drawn into an unimaginable political mess. She had promised she would never attempt to contact him in any way. She stays true to her word. Linda’s home is in upper state New York. She would learn the identity of the man she helped was Senator Lawrie who lived in North Dakota, and worked in Washington, D.C. It was fun to be part of a story that was blooming and growing in several directions and on many levels. I felt the spiritual aspect was believable. and it was fun to follow a Senator as he learns how to deal with the horrific load he carried. Through allegories related to Linda’s Garden work readers could see how God plants seeds of faith to take root, be watered, nurtured, and grow into something beautiful if we don’t let the weeds take over our lives, our hearts. Linda has Garden tours at her house. I had heard of them, but I had no idea all that went into creating and maintaining an amazing garden like she had with a lovely gazebo. When the Senator is ready to go back to work, his good friend Nathan helps Lawrie find a support system in D.C. They find a men’s bible study group there that keep him accountable. He stays in touch with Nathan who lives in his home town too. It was refreshing to read about a men’s group and how they keep each other on the path God has for each of them. These men are strong like-minded, like-hearted friends who pray, praise, tare vulnerable with and tell each other like it is. No one is an island. Lawrie has been that for far too long. He struggles to make the change. Then the story took a left turn I didn’t expect. I couldn’t believe the Senator would get himself involved in such a crazy situation. But then again, his life was falling apart at every turn. He refused to listen to those around him that told him this was bad news. I did enjoy the “unpresentable glory” “moments in the book where the characters recognize the hand of God in the situation. They recognize God’s grace in their lives that to many would go unnoticed. But someone with spiritual eyes could see that this could only have been orchestrated by God himself.” God moves in mysterious ways and most often in ways we could never imagine. His presence is constant whether we can feel it or not, He is with us always as Lawrie soon discovers intertwined in the Political backdrop and how that played out in the everyday lives of the people around him. This would make a good novel for book clubs. It has a little bit of everything inside, a splash of romance, deals with the rich and famous, in the back drop of a political arena, that discusses Native American issues and some current issues, family, friendship, loss, depression, forgiveness, courage, strength, responsibility, love and God’s grace. This is the first novel I’ve read by this author it won’t be the last. How do I review this unique book? I'm not sure even how to rate it. I really appreciated the quality of writing and editing, which deserves 5 stars! However, I don't think I agree with the author's main premise. Is this enough to deserve a star decrease? I guess. This is definitely not a book for those of us who just want a light romance to escape with. This book is for those who want to think hard, to be challenged in their beliefs, and to not escape from our current world but be confronted with How do I review this unique book? I'm not sure even how to rate it. This is a book where the plot's climax shows us that we've been thinking about everything wrong, and our perceptions must be completely overthrown. I figured out the first plot twist, wasn't surprised by the second one, but was taken completely aback with the third one. Without spoilers, I'll use the example of Nicholas Cage's 2007 movie, Next. I hated that movie because the very end showed that half of the movie never even happened. Though An Unpresentable Glory is not quite that dramatic, it still leaves the reader wondering what was really true. Unfortunately, it left me wondering who was really responsible for the happy ending. I had assumed it was God all along; once the twists were revealed, I wasn't so sure. And that's why I'm disappointed in the spiritual aspect of this Christian story. I was also surprised about which minor issues the author chose to focus on—politics of Democrat vs. Republican, Native American sensitivity, terrorism, and the economics of gardening. And I'm not sure I agree with the author on the first two, though I can't say for certain that I'm against her stance on either. But I felt that these issues would have been best left to nonfiction that could address questions from both sides, as I felt that both of them were quite one-sided. This story reminds me of a package that you unpack anxiously awaiting the gift that is buried under piles of paper. You have to remove each layer until the gift appears. It is like getting rid of unwanted weeds in a garden so you can see the beauty that God has provided. Each time I think about the book, I realize just how precious the words are that filled my soul with a deep love I have never felt. Linda is a gifted gardener who takes flowers and makes them works of glory. The gardens provide This story reminds me of a package that you unpack anxiously awaiting the gift that is buried under piles of paper. You have to remove each layer until the gift appears. It is like getting rid of unwanted weeds in a garden so you can see the beauty that God has provided. Each time I think about the book, I realize just how precious the words are that filled my soul with a deep love I have never felt. Linda is a gifted gardener who takes flowers and makes them works of glory. The gardens provide peace and comfort. When she discovers a man one day in her garden, she didn't know that that one moment would change her life forever. I loved how she took the man in even though he was a stranger. She saw this man as Jesus did. He was in need of kindness and to be shown the love of God. It would be hard to welcome a stranger into my home, but I know I couldn't turn away someone in need. Though their time together was brief, it set the stage for a story that will leave a lasting mark on many. Lawrie is a senator that has been under tremendous pressure. As he takes time to get his energy back, he senses a kindred spirit with Linda. She is kind, caring and asks nothing from him. Did God bring Lawrie to this woman? Will he find what he has been looking for to heal his broken heart? I loved the time they spent together and how they respected each other without crossing the line. After all Lawrie is a married man and the thought of being unfaithful is not why he was there. The story does have a political aspect to it and I did enjoy the part about Native Americans. It did show how even today they still have to fight for what was theirs. It really was a great addition to the story and allowed us to see inside the political world. Lawrie is torn when he has to make a big decision about his political career. His life will take a dark turn as rumors mount against him. Can he protect Linda from the medial? What will his wife beleive when she starts to hear the murmurs in Washington about her husband? There is a lot happening in the story but don't overlook the presence of God in every decision, every word and every unexplained moment that reminds us He will never leave us. Lawrie does seem to go through many hard moments; almost like Job in the Bible. I began to worry that Lawrie would give up and miss out on the most precious gift awaiting him. The story is also about the love between two people who feel they can't be together but never forget the brief time they spent together. There is some difficult subjects in the book that may be triggers for some such as suicide and depression. The author handles both subjects with grace and compassion. This is not your typical love story but a much deeper story of finding peace, happiness and hope. I enjoyed the premise to this novel — this idea of an unpresentable glory. An unpresentable glory is an action that at surface level looks not so good, but that is actually a kindness done to another person that allows that person to witness God’s glory. It’s kind of a confusing idea, but this concept reminded me of the me I enjoyed An Unpresentable Glory by Eleanor Gustafson very much. This book is a fast-paced, highly engaging page turner that I struggled to put down unless I absolutely had to. After taking a look at some reviews for.this book, I feel like I might be one of the few people who really didn't prefer this book. There was so much potiental. The description was pretty good as well as the writing and that is one of the main things that really make me like a book. The title is really intriguing, to be honest. An Unpresentable Glory. I'm not really sure how to explain what it means, but I think it's a neat one. I also found it interesting how the author intertwined politics as w After taking a look at some reviews for.this book, I feel like I might be one of the few people who really didn't prefer this book. There was so much potiental. The description was pretty good as well as the writing and that is one of the main things that really make me like a book. The title is really intriguing, to be honest. An Unpresentable Glory. I'm not really sure how to explain what it means, but I think it's a neat one. I also found it interesting how the author intertwined politics as well as grief and many other issues we struggle with today. My issue was mainly the unnecessary lengthliness of chapter at times. There's such a thing as too much description, and that aspect was unfortunately something that came to mind many times while reading. I also found the main characters to be two-dimensional, and really hard to connect with, especially Linda. Speaking Linda, this is probably an issue on my part as I would say this book was written for a different crowd. I, unlike some, really don't like plants and found her parts hard to want to read. I despise the idea of even keeping up with a garden, and pulling weeds sounds worse than mucking out a horse's stall (And believe me, I have done that). Although I did learn some interesting facts such as the fact that you can apparently eat violets and that garden tours exist, I found myself either tuning out or skimming those small paragraphs. Being the weird teenager I am, I completely forgot to write down content that could be offensive for some. The major one I remember for sure is a suggestive scene, with a husband thinking inappropriate thoughts towards his wife wearing a beautiful dress (does that spell it out for you? ), though it was written in an okay way. I personally didn't like that, but I suppose I can't speak for everyone, and I would advise you to venture carefully while reading this if you are as sensitive to certain topics as I am. I think I’m going to be one of the few who wasn’t a fan of “An Unpresentable Glory” by Eleanor Gustafson. I struggled to get in this one. This story has a powerful idea about an unpresentable glory. What does that mean exactly? An unpresentable glory is when looked at from the surface level does not look good, but is actually a type of kindness towards another person that allows the person to see the glory of God. It sounds confusing, but it is a kindness done to another person that doesn’t seek I think I’m going to be one of the few who wasn’t a fan of “An Unpresentable Glory” by Eleanor Gustafson. I struggled to get in this one. This story has a powerful idea about an unpresentable glory. What does that mean exactly? An unpresentable glory is when looked at from the surface level does not look good, but is actually a type of kindness towards another person that allows the person to see the glory of God. It sounds confusing, but it is a kindness done to another person that doesn’t seek recognition. This was something that I enjoyed and found challenged me to ask myself when I do things if I’m doing it for the glory of God or am I doing it to be recognized by others. This also deals with some heavy topics such as suicide, grief, amongst a bunch of other things that just makes Lawrie’s life tough. Without going into any detail a stir of events makes the reader wonder what else is going to go wrong for the poor guy. This was something I appreciated because it shows imperfect characters going through real things. I enjoyed watching his conversion to God and how he finds a great group of guys in a Bible study who become his accountability partners. The main thing that I struggled with was that I felt that the characters were two-dimensional. I felt like they were distant and I couldn’t relate to them at all. There were also times that I felt that the story dragged and that there was too much detail. For example, Linda, our main female character, is a gardener. There was one chapter towards the beginning of the book where they’re describing her garden. It wouldn’t have been a huge deal if it didn’t take an entire chapter. I think this book had some strong potential, but it wasn’t for me. Or perhaps it just wasn’t my time for it. It wasn’t my favorite book and definitely not on my list of books I’d recommend you run out to buy and read it, but it isn’t awful either. I hate giving poor reviews so please don’t pick up this book just because I didn’t like it. We all have different tastes so this might be one that you’d like. 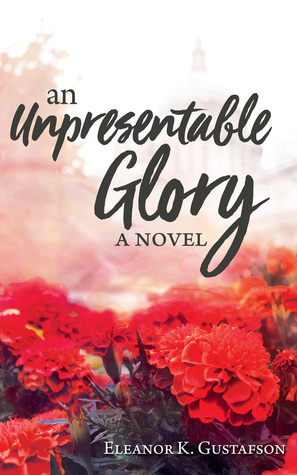 Things I Loved About An Unpresentable GloryI love the image of God's "unpresentable glory" in this novel. For me, it's the things that God has done that are behind the scenes, things that are maybe not mentionable in polite company. I love that God enters into the undignified places in our lives and shines his light in there - even if no one else will ever see. I loved the gardens and garden imagery in this novel. I don't know a ton about gardens - my sister is the agronomist. I know, I know - Things I Loved About An Unpresentable GloryI love the image of God's "unpresentable glory" in this novel. For me, it's the things that God has done that are behind the scenes, things that are maybe not mentionable in polite company. I love that God enters into the undignified places in our lives and shines his light in there - even if no one else will ever see. I loved the gardens and garden imagery in this novel. I don't know a ton about gardens - my sister is the agronomist. I know, I know - I should have consulted a soil scientist. Let this one marinate for a bit: what are the weeds in my life that need to be pulled, stomped out? I loved the two outstanding groups of friends Jay meets and bonds with in this story. TWO. (I guess he can have two groups since he has to bounce back and forth between two cities. But still. I'm a little jealous. Oops, there's a weed!). (Yes. Jealous of a fictional character. Yup. That's me.) This is something I am trying to cultivate in my life. But Jay has the benefit of being introduced to these groups that he then connects with. I keep trying to find those groups, or build them myself. This book felt long, and I love long books and usually get into them without even noticing. It took me some time to get into it. Once I did, I really did like the story. I really liked Jay's journey of faith and friendship especially. I didn't always like the way it was told. There were a few moments where I thought "do people actually talk like that in 2018?" I also felt like there was a rush to tie things up at the end. The style wasn't my favorite, and I think this just may be a personal preference/genre preference thing. Overall, though, I did like this book, and would recommend it to those who enjoy literary fiction. If you're looking for something fast-paced, this isn't your book, but if you'd like to be prompted towards introspection, it just might be. "My friend Linda Jensen's reputation has been injured, along with that of Senator Lawrence Crofter. And I inadvertently made it happen. A reporter turned a totally innocent remark into a scurrilous bit of muck that damaged them both. I sincerely regret talking with this man and dropping the clue that led him to put together the worst possible construct." This conversation sounds like it could have been spoken on the nightly news but it is instead found in this new book by Eleanor K. Gustafson. 'A "My friend Linda Jensen's reputation has been injured, along with that of Senator Lawrence Crofter. And I inadvertently made it happen. A reporter turned a totally innocent remark into a scurrilous bit of muck that damaged them both. I sincerely regret talking with this man and dropping the clue that led him to put together the worst possible construct." This conversation sounds like it could have been spoken on the nightly news but it is instead found in this new book by Eleanor K. Gustafson. 'An Unpresentable Glory' touches on a theme that is all too prevalent in today's society. A Senator is suddenly under attack and charged with a sexual encounter that never occurred and the public is overly eager to assume the worst. This is a beautifully written story between the Senator and the young woman who helps him in a time of need. They do grow to love each other deeply but they aren't guilty of physically acting upon their affection. This book paints a vivid picture of sins imagined and sins that are real; grief and tragedies that seem to overwhelm both of these characters and the possibility that all of the Senator's political achievements and victories will be lost. This is the first book that I've read by this author but she is a wonderful storyteller and it is obvious that she possesses a deep faith. Eleanor K. Gustafson shares it in this story with its underlying message that God is always there, His love remains forever and redemption is available to all of us. I especially like how she describes "God interventions" as "unpresentable glories". These are the times when troubles turn into blessings and I have experienced many of these in my own life! I received a complimentary e-book copy of this book via Just Read Tours, and am under no obligation to write a positive review. All thoughts and opinions are my own. This book is unique and very different from most “Christian” romance novels. The storyline is quite involved and kept me reading to see how everything would come together at the end. The author is a talented writer, and I’d read more of her books. But I’m still not sure how I feel about this book. There were sections of this story that I loved. There were also sections that I thought made the plot too long and should have been cut from the storyline. There were just SO many things happening that This book is unique and very different from most “Christian” romance novels. But I’m still not sure how I feel about this book. There were sections of this story that I loved. There were also sections that I thought made the plot too long and should have been cut from the storyline. There were just SO many things happening that at times I almost felt as if I were reading a different book about these characters. Then, unexpectedly at the end, it all tied together in a way that I never would have imagined to a satisfying ending. I think that I’d classify this book more as “crossover” fiction than “Christian” fiction, even though it has a thread of faith running through it. There are some scenes that, although handled appropriately, might make some Christian readers uncomfortable. Just be aware that this book is not all sweetness and light. The author did a great job of guiding the reader through difficult parts of the plot. So—-I’m sorry for this rather confused review. I loved part of this book and did not like others. This unusual book will appeal to some readers and not others. At some later date, I’ll probably go back and read this one again to see if I come away with a consolidated viewpoint. If you read it, I’d love to know your feedback on it. I trusted you, and some day, you may know just how much you hold in your hands.” Linda Jensen leads a relatively quiet life in Westchester County, New York, as the owner of a highly acclaimed garden. Inherited from her parents, the garden is her pride and joy. It is not so joyful finding a strange man sprawled near her delphiniums! The mysterious man is sick, unable to do anything more than drink water—and beg for secrecy. Ignoring all alarm bells, Linda sees to his needs, but her caring act tak I trusted you, and some day, you may know just how much you hold in your hands.” Linda Jensen leads a relatively quiet life in Westchester County, New York, as the owner of a highly acclaimed garden. Inherited from her parents, the garden is her pride and joy. It is not so joyful finding a strange man sprawled near her delphiniums! The mysterious man is sick, unable to do anything more than drink water—and beg for secrecy. Ignoring all alarm bells, Linda sees to his needs, but her caring act takes on unexpected significance, and unpresentable glory. Seeds of trust, and perhaps love, are planted in Linda’s garden haven. But as secrets are revealed and scandal hits the headlines, the act of caring for this man threatens to tarnish both of their reputations. Like weeds in Linda’s garden, circumstances threaten to choke out their fledgling relationship, and small moments prove to be the biggest influencers—on a national scale. My Thoughts: What would you do if you found a sick stranger on your doorstep? That's what Linda Jensen came home to one afternoon that changed her life. Her caring changed another persons life. It showed "Jay" what true caring and trust really was. This was an interesting read that keeps the readers' attention. All the characters were powerful in this novel and helped in supporting the storyline. This novel is about trust, integrity, loyalty and loving God. It's about trusting God in every situation. The author has a way of writing to keep readers' interest throughout the book. This is a good story for everyone. So much is happening in this book. While it seems like one kind of book, soon it's totally different. It becomes a story full of flawed and struggling people who are swept into something bigger than themselves. True, they could have made a few different choices up in the first few chapters of this story. However, since that didn't happen as it often doesn't in real life, you just keep reading about what occurred after that. The man Linda Jenson helped, a stranger, was not just any ordinary stran So much is happening in this book. While it seems like one kind of book, soon it's totally different. It becomes a story full of flawed and struggling people who are swept into something bigger than themselves. True, they could have made a few different choices up in the first few chapters of this story. However, since that didn't happen as it often doesn't in real life, you just keep reading about what occurred after that. The man Linda Jenson helped, a stranger, was not just any ordinary stranger. Her act of intended kindness has pulled her, and us as readers, into a much larger picture. This book has love and misplaced love. It has strength and weaknesses shown in various characters. My heart often hurt for Glynneth as well as being upset with her. Lawrie needs to figure himself out, and Linda. Oh, Linda. As she and others often prayed over issues they were dealing with, I was close to tears on a few occasions. This book was very different from most books in its genre. It's not afraid to mention that three lettered word that's always missing from "clean" reading, but it's not graphic. Instead, it shows emotions that are present or missing between a husband and wife and those issues happen to be crucial to the story. The writing style is rather back and forth from conversations to almost narration without a narration overtone. “An Unpresentable Glory” is a contemporary Christian novel. Filled with mystery, suspense, and romance the 368 pages went by quickly as I read it nonstop. My love for plants and flowers blossomed. I enjoyed the garden and floral setting. Author Gustafson has a delightful style of writing. It is smooth as butter and glides without a bump or hitch. Her use of humor and metaphors made me smile. The characters were vividly described and I found them well rounded and relatable. I felt like I knew Lind “An Unpresentable Glory” is a contemporary Christian novel. Filled with mystery, suspense, and romance the 368 pages went by quickly as I read it nonstop. My love for plants and flowers blossomed. I enjoyed the garden and floral setting. Author Gustafson has a delightful style of writing. It is smooth as butter and glides without a bump or hitch. Her use of humor and metaphors made me smile. The characters were vividly described and I found them well rounded and relatable. I felt like I knew Linda well. It was easy to become invested in this story. I was hooked from the very first page. The faith element was easily identifiable. This is a God glorifying book. Life lessons are woven all throughout this offering. Relenant, timely lessons for today were tackled. Also, I even learned a thing or two. All of those make for a wonderful reading experience. This is a beautifully written book. It is well planned, researched, organized, and executed. Author Gustafson is an extremely gifted wordsmith. Her book gently took my hand and took me inside its pages. I felt the story! I was there while reading it. Only great authors can do that. If you are looking for a very unique fiction that has a lot of layers to it this book is for you. The characters had real-life struggles that the author didn't mince words with, and the book addressed adult issues for sure, and how the presence or lack thereof of God in one's life made the difference in each character's life. I wouldn't say this book fits into one genre- it had romance, but not the typical you would expect, it has some inspiration, but it is presented in a different way, and it If you are looking for a very unique fiction that has a lot of layers to it this book is for you. The characters had real-life struggles that the author didn't mince words with, and the book addressed adult issues for sure, and how the presence or lack thereof of God in one's life made the difference in each character's life. I wouldn't say this book fits into one genre- it had romance, but not the typical you would expect, it has some inspiration, but it is presented in a different way, and it had some mystery to it, but more mystery in that you didn't really know what to expect. Honestly, I felt that the quality of writing was well done, but I found the characters not very relatable, and I felt that overall it was just too wordy and too abstract for me to where it just didn't flow well. Also, the way the adult issues were dealt with was just a little uncomfortable to me, and I felt like too much detail was given than really needed. With all that said, seeing as this fiction is definitely one of a kind, I would suggest you read it for yourself as my personal opinions don't seem to match up with a majority of readers. If you're looking for a totally unique Christian fiction, this one is for you! Ellie Gustafson writes pretty good books these days. Been at it long enough to learn a few things. It all started in 1978 with my first published article, “I Saw a Thing Today,” about a couple of weasels I met on a stone wall in Vermont. Short stories and other articles followed, and then came Appalachian Spring. BIG learning curve. The editor slashed characters, whole chapters, and made a lot of Ellie Gustafson writes pretty good books these days. Been at it long enough to learn a few things. It all started in 1978 with my first published article, “I Saw a Thing Today,” about a couple of weasels I met on a stone wall in Vermont. Short stories and other articles followed, and then came Appalachian Spring. BIG learning curve. The editor slashed characters, whole chapters, and made a lot of red marks everywhere. Had to rewrite the entire book—on a brand-new Apple IIe computer I had no idea how to operate. The novel was well received, however, which led to more novels and more painful learning experiences. A common book theme is the cosmic struggle between good and evil in light of God's overarching work of redemption. Having graduated from Wheaton College in Illinois—where I met my husband while teaching horsemanship (funny story there)—I have since been actively involved in church life as a minister's wife, teacher, musician, writer, and encourager. A host of other experiences, from mouse wars to house building, help bring color and humor to my fiction. I do like to laugh a lot. My husband and I live in Massachusetts, where he recently retired from teaching online college courses in philosophy. We travel a fair amount, spend time with three children and eight grandchildren, and enjoy camping at the family forest in Chester, Vermont.